This is Part 5 of a 5-part series on eating our way through Vietnam. We spent three weeks in Vietnam, starting with Hanoi in the north, making our way down over 1,000 miles to Ho Chi Minh City in the south. See Part 1: Introduction, Part 2: Hanoi, Part 3: Hoi An and Part 4: Da Lat. 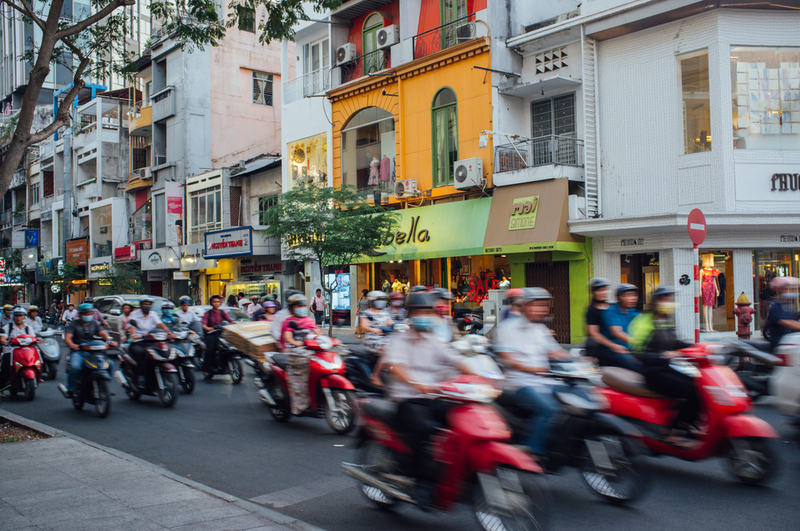 Ho Chi Minh City, also known as Saigon, is a bustling metropolis with millions of people and, probably even more, motorbikes. It’s a sprawling city with much more of a Western influence than Hanoi, up north. This meant locally brewed craft beer, a bean-to-bar chocolate factory, coffee shops with a passion for perfecting their product and modern cuisine options. Nightlife is popular here, with glitzy rooftop bars being the choice place to see or be seen. Nestled among this modern culture are alleys full of local food vendors serving up traditional and inexpensive food. We managed to strike a balance during our visit. Another distinct feature that stood out is many eateries did not provide paper napkins and instead charged for wet napkins, automatically provided with your food, only if used. We ended up renting an AirBnB in Phường (District) 1, close to the center of the city. The challenge of such a sprawling city is that it’s not very walkable; many of our food destinations involved Uber rides, which was actually a nice reprieve from the hot temperatures. Note that we actually visited Da Lat after Ho Chi Minh City, but geographically it makes sense to talk about Ho Chi Minh City last, as we wrap up our Eating Vietnam series. Like so many Vietnamese dishes, this one is seemingly super simple but so full of flavor. The name literally translates to “rice noodles with grilled meat”, which is almost half of the ingredients right there. You can’t forget fresh herbs, nước chấm, toasted peanuts and pickled vegetables to top it off, making it uniquely Vietnamese. Bún thịt nướng is like the cousin of bún chả, which is a more of a do-it-yourself version that we ate several times in Hanoi. Because we love bún thịt nướng so much, we were thrilled to find the bánh mì version in Ho Chi Minh CIty. Bánh mì, which translates simply to “bread”, is a sandwich usually stuffed with cold meats, pickled vegetables, greens, cucumbers, chili sauce and sometimes hard boiled egg. We had our favorite bánh mì in Hoi An. Bánh khọt are like the cousins to bánh căn, which we talked about in our Da Lat post. These are bite-sized pancakes made from a combination of rice flour, turmeric and coconut milk, topped with shrimp. They’re, of course, served with greens and nước chấm. Their cute little size makes them a great snack. I had been on the hunt for bánh xèo since we landed in Vietnam. It was difficult to find in Hanoi, but we did manage to enjoy it one rainy afternoon from a vendor who didn’t open until mid-afternoon. Since the north we had eaten bánh xèo only as a filling for the many roll-it-yourself dishes we ate, in Hoi An and Da Lat. There seemed to be more options for bánh xèo in Ho Chi Minh City, but unfortunately most were closed due to Tét. After some Google searching and walking around we came across a lone vendor, called Bánh Xèo Bánh Khọt Gỏi Cuốn, set up on the sidewalk in front of what looked like a parking lot, where there were a couple of tables for customers. Bánh xèo are thin pancakes made with a batter of rice flour and turmeric (lending it its yellow color), typically stuffed with shrimp, pork and bean sprouts and folded over into a semi-circle shape, then grilled until crispy. You can eat bánh xèo as is, or, slice a triangle and wrap it, along with fresh herbs, in a piece of lettuce, and dip it in nước chấm before taking a bite. In Hanoi we ate it almost the same way, but wrapped all of the above in rice paper. At Bánh Xèo Bánh Khọt Gỏi Cuốn we ate both bánh xèo and bánh khọt (see above). Rice flour cakes are fried on the grill until crispy, along with a slightly beaten egg and sliced scallions. All mixed together, they’re served in a heaping pile topped with shredded papaya and a side of sauce for either dipping or dumping. The portions are large so worth sharing unless you’re very hungry, and can be eaten as a snack or a meal. It looks and taste almost like a breakfast dish you might find at a greasy diner in the US, which, along with the sweet auntie who served us, felt comforting. Another simple dish, I liked the texture of the rice cakes, which were crispy on the outside and soft on the inside. The egg worked as a glue to hold some of the rice cakes together. Overall we enjoyed this dish, and the front row seat to the “kitchen”, but thought it could have used more salt. In Ho Chi Minh City we tried the more common way to eat cơm tấm (broken rice), versus how we ate it in Da Lat, which was with a variety proteins and vegetables on the side. At the restaurant Cơm Tấm Bụi Sài Gòn, we ate the rice (cơm tấm) once topped with pork chop (sườn), meatloaf (chả), pork floss, fried egg (trứng op la), pickled vegetables and nước chấm on the side and once with all of the above minus the meatloaf, pork floss and fried egg. Like so many other Vietnamese dishes, this one is seemingly simple, but the grilled meat is so flavorful and combined with the vegetables, cơm tấm and nước chấm, it’s kind of addicting. On the recommendation of our AirBnB host we tried hú tiếu for breakfast at a nearby noodle shop and ended up going back a couple of times because it was so good, despite the soaring temperatures outside. As we mentioned in our Da Lat post, hú tiếu is another Vietnamese rice noodle soup, but this time taking a page from Cambodia, specifically Phnom Penh, the capital, and using pork bone broth rather than beef bone broth. It’s very popular in the south of Vietnam; in fact, we didn’t come across it up north in Hanoi. At this spot in District 1, the customer chooses the type of noodles, the type of protein, and can even choose “dry” (we saw the broth served on the side in this instance). If you Google the address you will find two names for the restaurant: Quán Hủ Tiếu Mì 62 and Hủ Tiếu Mì Thập Cẩm, the latter of which is printed on the awning, so we'll go with that. The operation at Hủ Tiếu Mì Thập Cẩm was impressively seamless, especially as the tables were always full, often with a line outside. Like we mentioned in our Da Lat post, bún bò Huế is a beef noodle soup (bún bò) in the style of Huế, a central Vietnamese city that used to be the country’s imperial capital under the Nguyễn dynasty. The beef bone based broth is accentuated with lemongrass. Ours came served with beef shank, crab and pork meatballs and, similar to bún riêu, seasoned with mắm tôm (fermented shrimp paste). We ate this in an alley in the very crowded area around Cô Giang and Cầu Ông Lãnh, before our nose guided us toward porcine bliss in the form of bún thịt nướng. At some point we had to take a break from rice and broth based dishes, and bò lá lốt, which turned into one of Prem’s favorite dishes, was it. Minced beef is wrapped in lá lốt (lolot or betel leaves) and grilled before being topped with crushed peanuts and sliced scallions. The cigar shaped snack can be eaten simply as is with nước chấm on the side or it can turn into another do-it-yourself experience, complete with rice paper, rice noodles, fresh herbs and pickled vegetables. The latter was a delicious, and fun, way to eat it, and we did so at Cô Liên Bò Lá Lốt, where a sweet auntie oversaw the preparation as we admired the torn out newspaper articles featuring the establishment taped to the wall. We really enjoyed bánh cuốn in Hanoi so we were happy to eat it again anytime we came across it. Like many small, indoor eateries whose speciality dish is part of their name, Bánh Cuốn Hải Nam has their “kitchen” set up right in the entrance of the establishment, where one woman ladles the lightly fermented rice batter, steaming it into a crepe, another stuffs it with a mixture of ground pork, wood ear mushrooms and shallots, and a few others plate the bánh cuốn and top it with chả lụa (Vietnamese pork sausage) and fried shallots. Inside, the crowded tables are swarmed by waitresses in hot pink shirts, taking orders and dishing them out. We saw plenty of bánh tét in southern Vietnam, where it is most popular, since we were visiting during Tét, the Vietnamese New Year, a holiday in which this is a traditional food. It’s wrapped in banana leaves so we had no idea what was inside until we asked a vendor and then eventually just tried a bite after descriptions got lost in translation. It turned out to be sticky rice rolled around mung bean and pork to form a log shape, wrapped in banana leaf and then boiled. It’s usually cut into slices for eating (tét translates to “sliced”) at room temperature. We met a family-run vendor, selling homemade bánh tét on the sidewalk, who was kind enough to let us try some at no charge. It’s a delicious snack and easy to eat on the go. The roll-it-yourself meal strikes again! Wandering around our neighborhood searching for dinner, we saw diners seated at tables up and down a main street, but couldn’t tell which establishment they were part of. Finally we caught the attention of an employee who sat us at a table and provided menus (a rarity, as usually a limited menu is on the wall or there is only one option, therefore no need for a printed menu). The table next to us was eating a big grilled fish, rolling pieces of the white flesh in rice paper along with herbs and sauces. Not sure what this translated to on the menu, we pointed to it when our waiter came to take our order. Food seemed to be magically arriving from an alley, which Prem ventured down to take photos. Our fish arrived and it turned out to be a tasty meal we were glad to have stumbled upon. Plus, this is where we first learned that wetting rice paper makes it much easier to roll! We passed a woman on the street grilling something wrapped in banana leaves and decided to try it. We found out it was a ripe banana wrapped in sticky rice, rolled in a banana leaf and grilled. Once grilled, it’s unwrapped from the banana leaf and topped with coconut milk for a sweet and filling snack. We can’t wrap up our Vietnam eating experience without mentioning phở, again. Phở remained a constant throughout our trip and came to be our go-to dish for breakfast most mornings, and sometimes dinner. The flavor of the broth changed between the north (clear and beefy with hints of cinnamon and star anise) and the south (slightly sweeter and darker) but we could always count on it to be comforting, light, delicious and nourishing. Although phở gà (chicken) is also popular, along with other types of meats, such as meatballs, we almost always ordered phở bò, which is topped with thinly sliced raw beef that cooks quickly in the steaming hot broth. Phở is always accompanied by plenty of fresh herbs, sprouts, pickled garlic slices, red chili slices and lime wedges. Phở Lệ had the largest piles of fresh herbs on the tables that we had seen to date!